IMPORTANT: NativeScript is an inclusive community, and we expect all NativeScript community members, users, and contributors to treat each other respectfully. As such, all users of this repository must adhere to the NativeScript community code of conduct. Making the right technology choices is key to success. Our CTO’s guide to NativeScript helps you understand why NativeScript is the right choice for your next mobile project. Our Getting Started Guides are hands-on tutorials that walk you through installing NativeScript and building a real iOS and Android application. 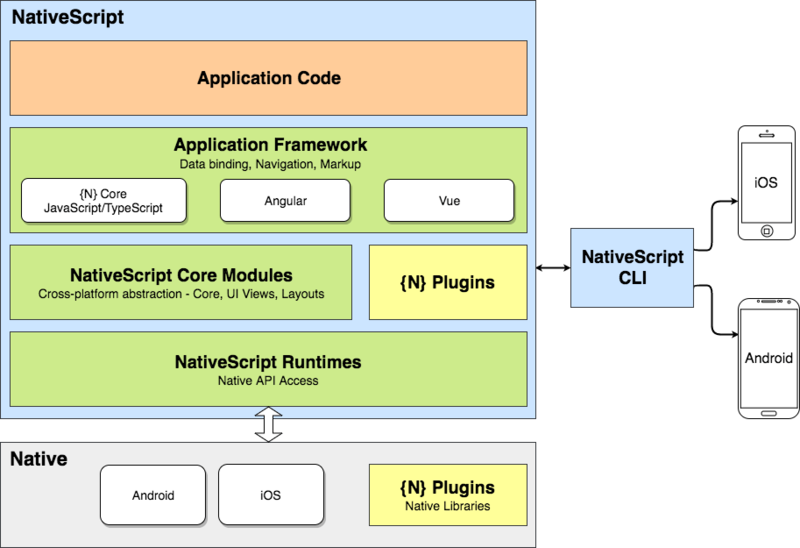 Below is a common NativeScript architecture diagram. In more detail, read the How NativeScript Works article. This repo contains the NativeScript command-line interface, which lets you create, build, and run apps using the NativeScript framework. The CLI is written in TypeScript. This repo contains the NativeScript framework documentation, which is available at http://docs.nativescript.org/. The docs are written in Markdown. In addition to the code that makes up the NativeScript framework itself, we also provide a number of open-source sample apps that you can reference while building your NativeScript application. We love PRs, and accept them for all of our repositories—even docs! Please follow our contribution guide if you want to become part of the project. We worked together with the Google Angular team to make Angular 2+ work on top of NativeScript. To use Angular with NativeScript please follow the getting started article. Please, use github issues strictly for reporting a bugs or requesting features. For general NativeScript questions and support, check out Stack Overflow or ask our experts in NativeScript community Slack channel.